Values have always been a central topic in both philosophy and the social sciences. Statements about what is good or bad, fair or unfair, legitimate or illegitimate, express clear beliefs about human existence. The fact that values differ from culture to culture and century to century opens many questions. 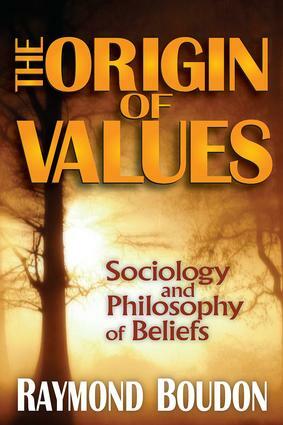 In The Origin of Values, Raymond Boudon offers empirical, data-based analysis of existing theories about values, while developing his own perspective as to why people accept or reject value statements. Boudon classifies the main theories of value, including those based on firm belief, social or biological factors, and rational or utilitarian attitudes. He discusses the popular and widely influential Rational Choice Model and critiques the postmodernist approach. Boudon investigates why relativism has become so powerful and contrasts it with the naturalism represented by the work of James Q. Wilson on moral sensibility. He follows with a constructive attempt to develop a new theory, beginning with Weber's idea of non-instrumental rationality as the basis for a more complex idea of rationality. Applying Boudon's own and existing theories of value to political issues and social ideas—the end of apartheid, the death penalty, multiculturalism, communitarianism—The Origin of Values is a significant work. Boudon fulfills a major task of social science: explanation of collective belief. His book will be of interest to sociologists, philosophers, psychologists, and political scientists.